Samar King is an American Palestinian and the artistic director Yaa Samar! Dance Theatre, a dance company based out of both Palestine and New York City. She shares her perceptions on living and creating dance in the midst of a politically disenfranchised region, as well as how she uses dance to create social discourse. Tell me a little about your personal dance history. I grew up in Alabama to a Palestinian mother and an American father. I started at a hometown studio with jazz, modern and ballet. From there I went to a conservatory in Huntsville, Alabama, which was focused on classical ballet, and from there I went to the Ailey/Fordham BFA dance program in New York City. My sophomore year, I did a concentration in composition and choreography, and studied under Kazuko Hirabayashi, as well as JoAnna Mendl Shaw and Helen Pickett. I was under Kaz’s wing for three years, and then I continued working with her after graduation. I initially worked mostly in an administrative capacity, but Kazuko continued to artistically mentor me, and gave me the opportunity to teach improvisation, composition, and to keep working on my own choreography. Simultaneously, I started my company, Yaa! Samar Dance Theatre (YSDT), with associate director Zoe Rabinowitz, on the eve of our graduation from university. We were artists in residence at the Tribeca Performing Arts Center and the Lower Manhattan Cultural Council. There, we developed our first evening length piece. That was in 2005, and from there we just kept going. In 2010, I moved to Palestine. I had been back and forth before as a child. Most of my family is in Jordan, but we’re Palestinian. In 2007, YSDT presented our first performance in the Arab world through the Ramallah Contemporary Dance Festival. The next time the company went to Palestine, in April of 2010, I had been coming quite frequently and had established a routine with the artists I was meeting. And by that December, I moved to Palestine. I didn’t think it was a long-term move, but I’m still here. I basically switched my base; instead of living in New York and primarily going to Palestine, I live in Palestine and primarily go to New York. My partner was denied a visa, which was the reason I moved here. The visa process is pretty stalled, considering the current political landscape with regards to immigrants. Once I realized my reality was different than I planned, I started developing more work in Palestine. The Ramallah Contemporary Dance Festival started in 2005, so there was already interest in contemporary dance. I joined that developing force. Most of YSDT’s company artists are now based in Palestine. I still work with a few artists in New York as well, but it depends on the programming. We use Skype quite a bit, and our board is in New York, but most of our art-making happens in Palestine. What is the dance scene like in Palestine? There are pockets of dance, rather than a big scene. Because the pool is so small, a lot of our artists seek opportunities abroad. Once they reach a certain level, they start touring, so they’re not constantly here. There’s a lot of coming and going. Many of the artists who I started working with don’t live here anymore. Even some of our current dancers are considering leaving because it’s not easy here. It can be strangling at times. A lot of the young population in their 20s and late teens are looking for opportunities to get out. I’ve reassured many of my dancers that if they want to go abroad, they still have a place in my company. We don’t have to close doors. Adaptability is one thing I’ve gained from working here. Oftentimes, events are beyond my control, so I have to figure out another way. The dancers I’ve been able to work with for the longest period of time in Palestine has been four years, and the dancers in New York, 12 years. We’re developing an artistic language and challenging ourselves in the studio. It’s like a laboratory; there’s personal and collective growth. Outside our bubble, there’s a larger conflict that’s hard to come to terms with on many levels. It can be hard to balance, but I try to keep doors open, while keeping in mind the reality at hand. We can wish for things to change politically, but, at the end of the day, we’re living in a hard reality, so we either adapt or we stop. And I don’t want to stop yet. Neither do the artists I work with; their work ethic and commitment are relentless. 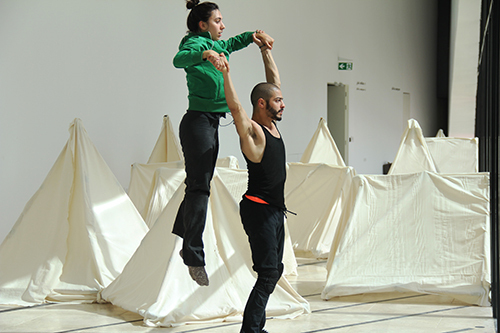 In terms of a scene, we have the Ramallah Contemporary Dance Festival that happens every year. It’s important for so many reasons. Primarily, it’s the vehicle through which so much dance has entered the Palestinian community. Young dancers get to see what’s going on in the dance world outside of traditional or commercial dance. 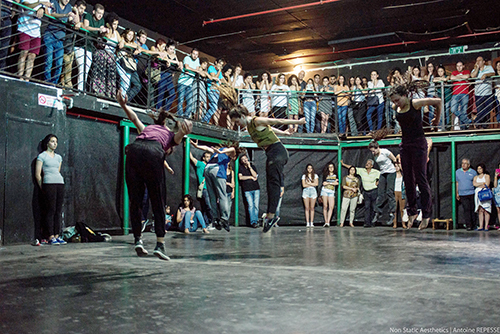 Companies give workshops and choreographers set pieces. It helps in the development of our artists. Since you’ve presented work in a myriad of places, do different audiences view work differently? Is there a different way of viewing and approaching dance in, say, Palestine versus New York? I don’t think so. You’d be surprised how many foreigners are here in Palestine, and how many Arabs work abroad. I don’t feel a difference. I also don’t feel as though I create different works for different audiences. I’m Palestinian, but I didn’t grow up here. I had to learn about cultural norms and what I could push. I get asked a lot about contemporary dance in the Arab world, especially considering what people see in the news. Even if you’re not reading mainstream publications, you can’t know the reality until you spend a lot of time here. The layers are massive. What do you believe is dance’s role in bringing about social discourse? I’ll take our most recent work, “Against A Hard Surface,” as an example, which I co-created with Palestinian theater director Amir Nizar Zuabi. Within the piece, there’s a massive wall. Of course, a fair number of people assume we’re referencing the Green Line separating Palestine and Israel. Interestingly, Nizar and I are using the wall to represent various borders/divisions. If you give humans an obstacle or border, we will try to pass it, regardless of what’s waiting on the other side. It’s not wrong to think the piece is about the Green Line when 99 percent of the production is Palestinians making work in Palestine. But there are many different layers to the piece. For me, it’s about the fact that people will use everything they own — their body, mind and agency — to break down obstacles, whether it’s a physical or emotional barrier. That intensity and commitment is partially what guides me in my everyday life. There are many things that will knock you down, especially here in Palestine. Whether it’s a person or government system putting you in your place, I push myself to keep hitting the wall, to keep pushing and adapting to survive. There’s a lot of beauty in this harsh physical reality. It’s brutal and obvious. In one way, there’s this overt socio-political dialogue, because of the context the piece was created in. But it’s also a very personal thing. At different times in my life, I’ve kept hitting the wall, kept getting up and going. Samar Haddad King, artistic/founding director of Yaa Samar! Dance Theatre, graduated from the Ailey/Fordham BFA program in New York City under the tutelage of Kazuko Hirabayashi. In 2005, Samar formed Yaa Samar! 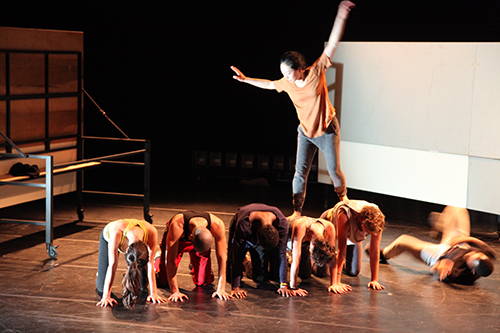 Dance Theatre (YSDT), a non-profit dance theater company based between NYC and Palestine. Her work has been commissioned in the US by the Ailey School, Configuration Dance, Hubbard Street 2 (where she was the recipient of the National Choreography Competition), among others, and has been performed at various venues such as NYC’s Joyce SoHo, HarlemStage, Citigroup Theatre, Chicago’s Harris Theater, and Jacob’s Pillow. Commissions in the Arab world include Catching the Butterflies in Amman, Jordan (2010); From Dust for the Ramallah Contemporary Dance Festival (2012); Playground, a site-specific work for the international /si:n/ festival in Ramallah (2013); Bound, a collaboration between Sareyyet Ramallah and YSDT (2014); and Not/Tob for the Qalandia International festival (2014). To learn more about Yaa Samar! Dance Theatre, click here.